On October 30th the China Lithuania International Fin-Tech Cooperation Forum was held at the headquarters of the leading Chinese cross border e-commerce marketplace DHgate. 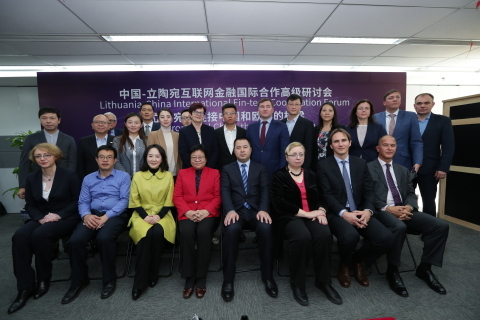 The Lithuanian Ambassador to China Ms. Ina Marciulionyte, DHgate Founder and CEO Ms. Diane Wang, Board member of the Bank of Lithuania Marius Jurgilas, and over 100 government officials and FinTech executives from both nations attended the forum. The forum featured an in-depth discussion on how China and Europe can collaborate to capture the rising opportunity of FinTech to facilitate bilateral trade. Ms. Diane Wang, the Founder and CEO of DHgate.com, China’s first and biggest B2B cross border e-commerce marketplace, made an introduction, “DHgate is very honoured to host this forum to encourage more discussion and cooperation between China and Lithuania in the area of FinTech, to use China’s practices, serve global needs, through Lithuania, to bring benefits to society”. China is recognized as one of the most advanced markets for FinTech. Third party payment transaction volume, at over 10 trillion RMB, easily overshadows US and EU leaders. The wealth management transaction volume reached 700 billion RMB within just 2 years, and this is just the beginning of everything. Beyond domestic markets, leading digital platforms are poised to expand to international markets. Camel Financial, a Chinese FinTech firm that originated from DHgate, is one of these platforms. During the forum, the board member of the bank of Lithuania Mr. Marius Jurgilas expressed his expectation on providing a gateway for Camel Financial for its technologies and network to expand into all EU economies. Mr. Marius also expressed their welcome and willingness to facilitate the process for Camel Financial to set up a specialized bank in Lithuania, and through Lithuania to enter into more European markets. DHgate.com is the first to market and the biggest B2B cross border e-commerce marketplace in China, providing global importers with quality products at competitive prices. Founded in 2004, DHgate.com has approximately 10 million global buyers from 227 countries and regions, with 1.4 million global sellers offering 40 million products in 8 languages.